Beautiful scenery is one of the main attributes to Thailand’s popularity for travellers around the world. Krabi province is located in the southern region of Thailand and is home to some of the best beaches around the world. Many of the beaches here are often characterised by white sands, clear blue waters, and a fantastic atmosphere to enjoy it all in. One of the best parts about Krabi is that nearly everywhere you go here, you will find a new and unique experience. Railay Beach is one of those destinations. Railay is one of the highlights in Krabi and in a way, can give you multiple beach experiences all in one peninsula. Railay Beach is located on a peninsula on the southern coast of the Krabi province. The peninsula is isolated from the mainland because of the landscape. It will require a long boat trip from a few pickup locations in order to access the main beach. The main pick up locations for these boats are Krabi Town, Ao Nang, and Phuket. The ideal location may change depending on the season. Krabi Town is most people’s introduction to the Krabi province, so there are many travellers beginning at this point in order to reach Railay Beach. There is a pier in Krabi that has boats running throughout the day that will take you directly to Railay. This is a popular option during the low season for accessibility but is a longer journey compared to other methods. The boat trip is about 45 minutes long and departs at various times during the day. It’s best to plan ahead and make a note of the schedule if choosing this option. Ao Nang is located a short distance away from Krabi Town and is a more popular starting point for the boat trip to Railay Beach. Travelling from Ao Nang to Railay Beach only takes about 15 minutes. This will be the typically recommended place to begin if you are visiting during high season. The boats leaving from Ao Nang run more frequently and even late into the night. Phuket also has a lot of travellers looking to journey to Railay Beach. When you are travelling from Phuket to Railay Beach, it’s important to pay attention to the seasons. The distance to Railay from Krabi and Ao Nang is much shorter. The boats you take from these places are long boats that fit only a handful of passengers at a time. The trip from Phuket is a bit longer, so there are many ferry services that will take you to Railay. These ferries have capacities of hundreds of passengers at a time and Railay Beach is one of the many stops on their journey. Phuket provides this ferry service only in high season. The service is closed during low season due to the change in weather and the water is harder to navigate. It is still possible to get to Railay Beach. These same ferry service providers will take you across the land to Ao Nang. From Ao Nang, you will proceed as usual to Railay Beach. Travelling to Railay Beach requires a bit more effort than most people would expect for a popular tourist destination. You will quickly see why the journey is worth it the moment you arrive at Railay Beach. Railay Beach is known as one of the most beautiful places in Thailand. The natural landscape combined with the amazing beaches make it one of the most popular beaches in Thailand. Railay is a unique beach compared to others. There is a gulf that runs in the middle of the beach. This gulf separates the beach into seemingly two different experiences called West Railay and East Railay. Both sides have their own unique offerings, and you will want to explore both while here. West Railay Beach is definitely the more popular of the two sides of the Railay peninsula. There are several boats that dock here to gain access to the beach. West Railay gets a lot of attention from visitors because of the beautiful scenery here. It is a fairly large beach, and the waters here are clear blue. West Railay offers many beach activities to enjoy and has a lot of bars and restaurants to enjoy and resorts to stay in. There will be plenty of activity in both the daytime and night on West Railay. West Railay Beach specifically caters to the influx of visitors to the island and those that take advantage of the beach resorts. Railay Beach has plenty of activities to keep you busy on a day trip to the beach. You will probably spend most of your time around West Railay Beach. 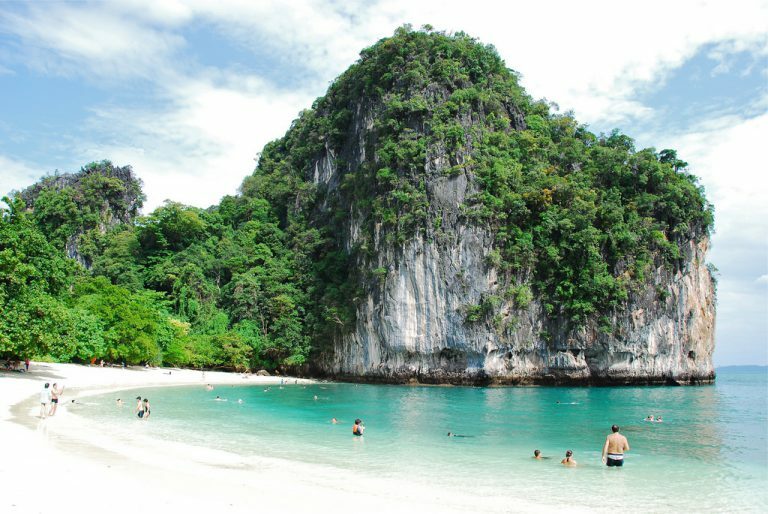 The biggest attraction to West Railay is the actual beach. Many people enjoy the views and just laying out on this beach for hours at a time. The beach will definitely be full of other travellers but it’s big enough for everyone to spread out. If you are looking to be a bit more active while at Railay Beach, there are many services provided here to accomplish that. Along the beach, you will find many water activity rental places such as scuba diving, kayaking, snorkelling, etc. There are many shops that provide all the equipment you need. Many of them also provide an instructor to take you out into the water. This may be a good option if you’ve never tried it before and to get tips on the best location on the beach for it. West Railay Beach also has an extended strip of bars and restaurants when you need a break from the water. This area is especially busy during the night time. If you are a fan of large crowds, then you will really enjoy the nightlife around West Railay Beach. The streets are always active with people switching between the beach and the strip of bars and restaurants. West Railay has more of a party atmosphere. You can enjoy great music and drinks long into the night and West Railay has plenty of choices as to where to go. West Railay Beach is always open for you to enjoy even at night. Groups of people gather at the beach for their own impromptu parties. Something that you rarely find in more other nightlife hotspots, areas such as Phuket or Bangkok party zones. Every month on West Railay Beach you will discover the Full Moon Party. This is one of Thailand’s biggest beach parties and attracts people from all over the world to experience it. East Railay may be another first welcome point onto Railay Beach. This is also where several boats dock on the beach for visitors to unload. East Railay is not very popular for its beach scene. This area has a lot of rocky sands and darker waters. It is also covered in small mangrove trees. You will not find too much beach and swimming activity on East Railay because of these conditions. East Railay is, however, popular for other reasons. This side of the beach is where you find a lot of great bars and restaurants on the peninsula. East Railay has several activities to enjoy outside of the beach. This end of the beach has plenty of food options and bars. Since it’s a less crowded side of the beach compared to West Railay, you can often find cheaper options here from the food to the hotel resorts. Railay beach is known for rock climbing, and East Railay has several of the best climbing spots on the beach. The beach has tall cliffs and a variety of rock formations which make it the perfect place for recreation. This is an organised activity and can accommodate both beginners and expert climbers. One of the most popular attractions for East Railay is the Diamond Cave. The Diamond Cave experience is a walk through of a naturally formed cave on the beach. The cave provides a walkway to make it easier to venture through to the other side. Although the walkthrough is relatively short, you will see many unique sights inside. There are several tall rock formations stretching up to its tall ceiling. There is also the chance to get a glimpse of wildlife inside such as monkeys and bats. The Diamond Cave can be located right behind the Diamond Cave Resort, an accommodation that takes advantage of the proximity and beauty of the cave. East Railay is a much more laidback side of Railay beach. This side of the beach has much fewer crowds than the west side. It does still have a nightlife scene and could be exactly what you are looking for depending on your interests. Many of the bars and restaurants in East Railay stay open late into the night. These are the perfect venues if you want to enjoy your night with not as many people around. East Railay is a true beach town. You will find that a lot of the bars play reggae music to match the laid-back vibe of this side of the beach. West Railay and East Railay are the most talked about areas of the peninsula. Many people only come to Railay Beach on day tours while exploring Krabi and the other islands nearby. If you only have a day at Railay Beach, then you will surely find enough to keep you busy between the two sides of the beach. It’s likely that you may consider staying around Railay Beach for a couple of days more after you arrive. The beautiful scenery is enough to make every sunrise and sunset a new experience each time. There are also less frequented gems of Railay Beach. The peninsula also has two additional beaches that give a more exclusive beach atmosphere. Tonsai Beach and Phra Nang Beach are just short walks from anywhere on Railay Beach. Fewer people mean more beach for you to enjoy. There are also less frequented gems of Railay Beach. The peninsula also has two additional beaches that give a more exclusive beach atmosphere. Tonsai Beach and Phra Nang Beach are just short walks from anywhere on Railay Beach. Fewer people mean more beach for you to enjoy. Tonsai Beach is located next to West Railay Beach and is accessible at most times by walking. Sometimes this path is covered up during certain seasons when the water shifts. This is a major reason why Tonsai Beach is more exclusive than West Railay Beach and offers a quieter beach experience. Tonsai Beach is a stand-alone area. The beach area has its own bars, restaurants, and entertainment for visitors. The beach is perfect for all of the same water activities available at West Railay Beach. Several cliffs surround the beach as well making Tonsai Beach the perfect location for rock climbing. There are many hotels and resorts on Tonsai Beach that are more upscale than the rest of the peninsula. Visitors do not typically recognise Phra Nang Beach as a part of Railay Beach. It is positioned between Ao Nang and East Railay. You can walk to this beach from East Railay, but it still requires a boat from Ao Nang to reach it. Phra Nang Beach is very comparable to West Railay Beach. The two beaches have a lot of similarities. Phra Nang Beach is a good alternative to West Railay Beach in case it gets too busy during its peak season. The water activities at Phra Nang are also abundant, and there are several cliffs for rock climbing that will give you amazing views over the beach. Railay Beach is definitely a must-see if you are visiting the Krabi province. The beautiful scenery, the amazing beaches, and great nightlife are just a few of the reasons why many people find themselves on Railay Beach. It is also very accessible from many of the other popular places around Krabi. Railay Beach makes a great day trip to explore the peninsula or an extended stay to take advantage of everything you will find here. Krabi is a province in Southern Thailand. It is often considered one of the most exciting regions of the country. Krabi’s numerous islands and beaches have endless scenic beauty, and many tourists come all year round to experience this unique gem of Southeast Asia.